What Does Flooding Have To Do With Aggression In Dogs? It’s not surprising that many people, including trainers don’t really understand the ramifications of flooding dogs. What happens after a dog has been flooded, is that the stress of being forced into a scary situation builds up to a point where they may and often do lash out at a person, dog, child, etc. and this often won’t happen while a dog is being flooded, but after. It could be a couple of hours after, a day later or even longer for some. 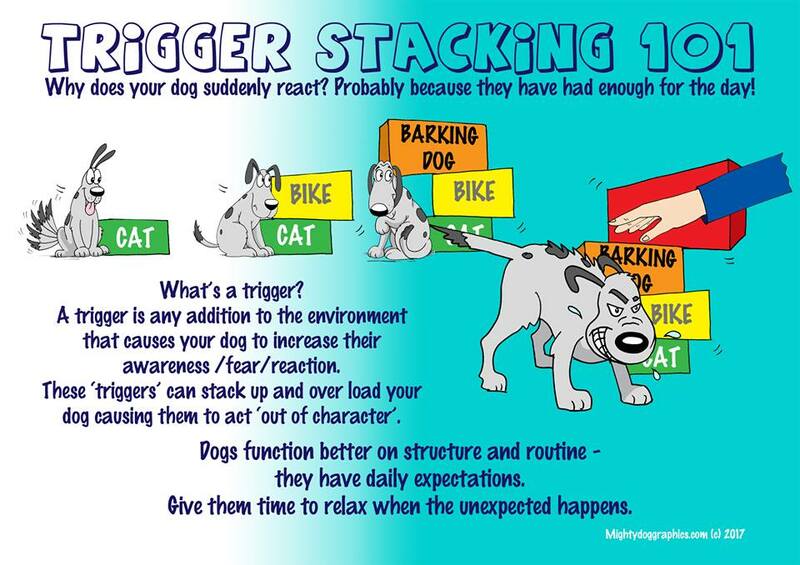 This is called trigger stacking as simply explained in the graphic below. The key to learning that flooding doesn’t work is to connect the dots with the behavior during and after a dog has been flooded. 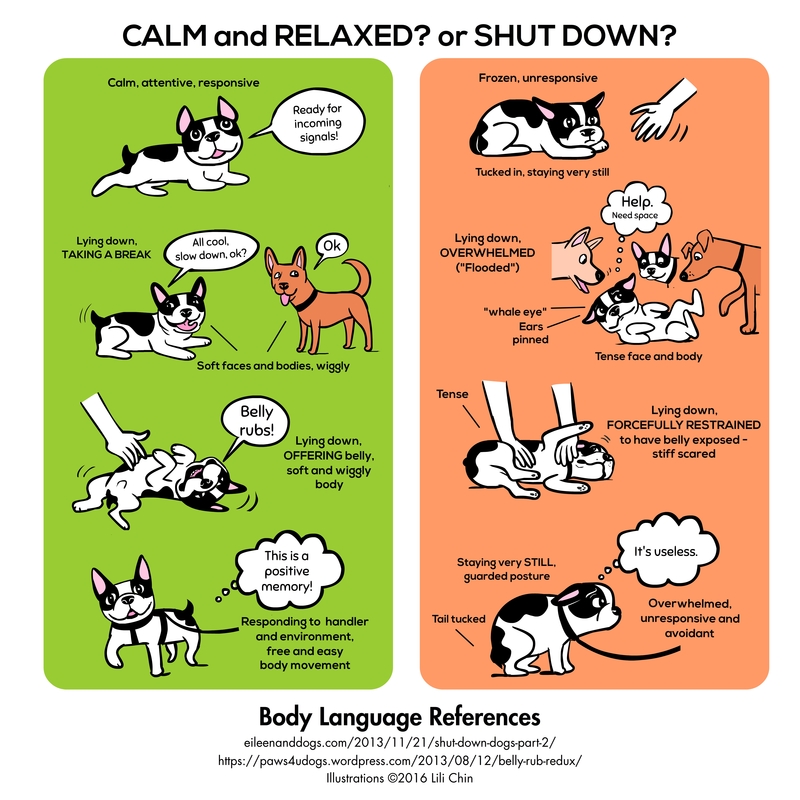 Of course, learning to read dog body language; the signs of fear and anxiety are crucial in understanding how to help them. 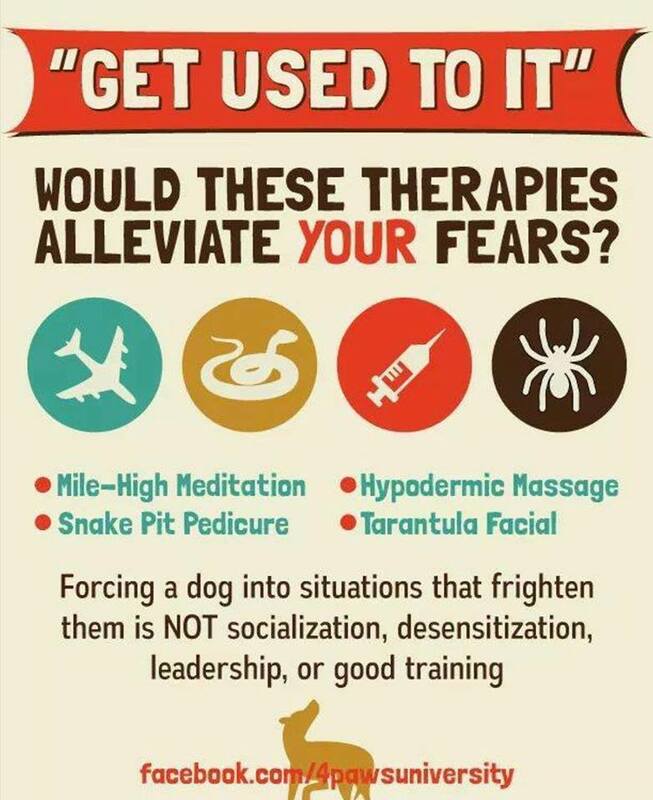 Most experts agree that fear is the first sign of aggression, therefore working with fearful, timid or unstable dogs needs to be taken much more seriously, for everyones sake. A dog who is flooded is shut down. They are in overwhelm, so they shut down their senses as a coping mechanism because they know they can’t get away from the fear. They may be on leash, in a crowd, even a party at your home or a crowded place like an outdoor market, a dog park, doggy daycare facility, etc. It may also happen while training. For example, if your dog is afraid of horses, you might think that bringing him to a dog friendly herd or inside a barn, will help him get over his fear of horses… it won’t. This couldn’t be more wrong. Dogs who are flooded may manifest one or many of these signs and behaviors: Disengage, look away, lie in a corner, hide, shake, pant, lip lick, have a whale eye (whites of the eyes showing), paw lift, pace, rounded body, tail tucked, bark, etc. as shown in these graphics. Many trainers, including Cesar Milan use flooding as a technique, as seen in the horrible pig incident where the dog ended up going after and biting the pig. After more and more flooding, Milan boasts that the dog is now calm and relaxed around pigs, being shown tied to the pig forcing him to walk with the pig. This is not calm and relaxed. It’s shut down. Recently, I became aware of someone with an aggressive dog. He’d been in denial about his dogs aggression, stating it was just that the dog needed time to get to know other dogs and people. That’s fair, and very common. Yet, when the dog continues to lunge and go after other dogs he’s already met, well it’s much more than this. It’s aggression. You’re either pregnant or your not! It’s the same with dogs, while some aggressive dogs are more expressive than others, it’s aggression nonetheless. Something needs to be done to help them feel less fearful or someone will get hurt, emotionally and or physically. Since this man was in denial about his dog’s aggression, he invited friends with their dogs for dinner, all of whom the dog new, there shouldn’t have been a problem with his dog, but denial is a false belief, things can go awry in a flash. The evening went seemingly well and uneventfully, to the untrained eye, until the next morning. For the aggressive dog, being in a crowd, in his own home was too much for him. He had no way out (was flooded), so pretty much stayed out of harms way, in other words was disengaged and shut down. One couple stayed the night and while visiting the following morning over a cuppa joe, the dog who was flooded the night before, went after the couples’ dog. The good news is that no harm was done but had the other dog been fearful/aggressive as well, a fight could have ensued, leading to one or both of them getting hurt. This is where it gets dicey for many people. They think because no damage was done, that their dog isn’t really aggressive and why many folks with aggressive dogs are in denial. The bottom line is that others are in danger in their presence. 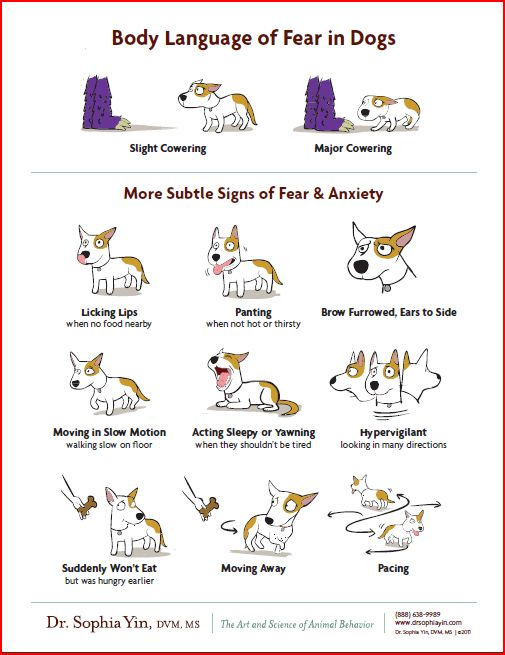 Learning to read dogs and the signs of fear and anxiety will go a long way to building confidence in fearful, unstable or timid dogs. As guardians of these dogs, it’s our responsibility to manage them, not only for their own anxiety but for everyone else’s safety, as well. It’s not a matter of if but when the next dog or person will be a victim. Don’t we owe it to dogs to help them overcome their fears and keep everyone out of harms way? I think so.